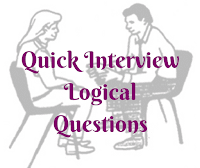 Most of the time Tough Logical Questions are being asked in interview. However sometime interviewer wants to check your alertness. 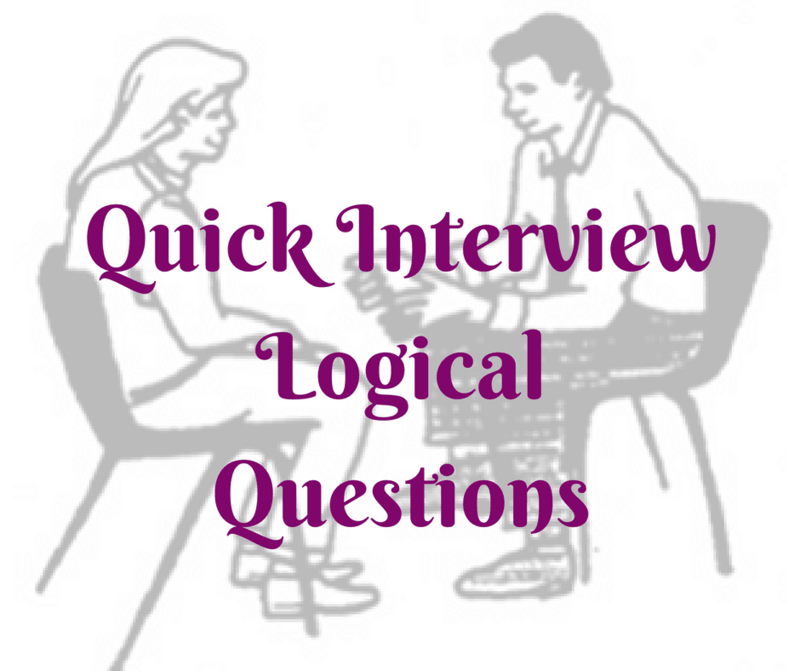 So quick interview logical questions are being asked in which very less time is given to solve the problem. Here we am putting some of these easy interview questions which one need to answer quickly. These Quick Interview Questions are part of Fun Brain Teasers and Riddles. Answers to these interview questions are given at the end of this post. I have hidden the answers to avoid any spoiler. Do select the text between two numbers to the watch answer to the specific question. 1. Two fathers and two sons decided to go to a shop and bought some sweets upon reaching. Each of them bought 1 kg of sweet. After sometime all of them returned home and found out that they had 3kg of sweets with them. They did not eat the sweets in way, nor did they threw or lost anything. Then, how can this be possible? 2. A man started a questionnaire game. He kept asking the same question to whomever he found. The answer each time was different. However every time the answer he got was correct. 3. Pooja was born in 1895. She just had her 30th birth day today in year 2017. How did that happen? 4. A train full of passengers goes through a tunnel. When the train comes out from the other end, there is no Single person on the train. How did it happen ? 5. You board a accelerating train. The train will have to enter a tunnel soon. You are claustrophobic. Which place is the best for you to sit ? 6. In a knockout competition 23 teams are there. How many matches needs to played to determine the winner? In case you found the answer quickly after quick calculations, lets generalize this questions to say that in a knockout competition N teams are there. How many matches needs to played to determine the winner? 7. Baseball bat and ball cost ₹50. If the bat cost ₹49 more than the ball. What is the cost of each? 8. If Mother's name is Mrs 62 and her son's name is 52, her daughters' name is 42 then What is the name of the father? 9. Find three whole, positive numbers that have the same answer when multiplied together as when added together. 10. One day Mona celebrated her birthday. Two days later her older twin brother, Gaurav, celebrated his birthday. How come? 11. How can you throw a ball as hard as you can and have it come back to you? The ball doesn't bounce off anything? There is nothing attached to the ball, and no one else catches or throws it back to you. 12. If a doctor gives you 3 pills and tells you to talk one pill every half hour, how long would it be before all the pills have been taken? 13. If you drove a bus with 32 people down the Inner Ring road from Koramangla, Bangalore and stopped at Song World Singal to pick up 4 more people and drop off 2 passengers, and then stopped at Ejipura to drop off 5 passengers and pick up 3 more, and eventually arrive at Old Airport Road after 1 hour later, what's the name of the driver? Below are the answers of these Brain Teasers. Do select the text between then numbers to lookout at the corresponding answer. 1. Son, Father and Grandfather went to shop making it two fathers and two sons. 2. He asked what time it is? in his questionnaire. 3. 1895 is room in which Pooja was born. So, Pooja was born in Room no. 1895, 30 years back. 4. All people in the train are married making it that there is no Single person on the train. 5. As the train is accelerating, the back seat of the last coach will be the best. The reason is because, the train will be accelerating after the stop and thus, it will be much faster when the back of the train enters the tunnel than when the front of the train enters. Thus you will have to spend less time in the tunnel. In case train is deceleration then it will be front of the seat to sit, so that you can spend less time in train. 6. In a knockout competition one match is required to knockout one team. So to knockout N-1 teams we will require N-1 matches i.e. 22 matches in our competition. 10. Mona is born just before 12 night on 28th Feb and Gaurav is born after mid night i.e. on 1st March. The year which is being talked is leap year having 29th Feb. This is the reason Gaurav will celebrate his birthday after 2 day of Mona's birthday. 11. You throw the ball up in air vertically. 12. 2 hours. First one now, second after 1 hour and 3rd after 2 hours. 13. Your name, as you are the driver. Here is answer to 16th Brain Teaser Question of post titled "Out of Box Thinking Fun Brain Teasers with answers to Challenge your Mind ".